With a stay at Casas Oasis in Santa Marta, you'll be within a 15-minute drive of Artisan Market and Varadero Beach. Free self parking is available onsite. With a stay at San Juan in Santiago de Cuba, you'll be a 2-minute walk from San Juan Memorial Hill and 6 minutes by foot from San Juan Hill. Free self parking is available onsite. When you stay at Hotel Balcon del Caribe in Santiago de Cuba, you'll be 7 minutes by foot from Castillo de San Pedro de la Roca. Free self parking is available onsite. 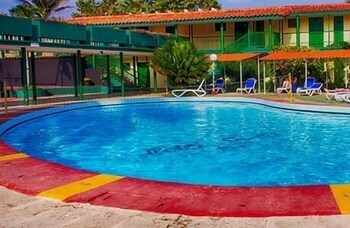 Located in Holguin, Pernik is within a 10-minute drive of San Isidiro Cathedral and Las Flores Park. Free self parking is available onsite. With a stay at Hotel Florida in Havana (Old Havana), you'll be within a 5-minute walk of Museum of the City of Havana and La Bodeguita del Medio. Located in Sancti Spiritus, Villa LOS Laureles is within a 15-minute drive of Serafn Sanchez Square and Iglesia Parroquial Mayor. Located in Playa Giron, Pío Cuá is within a 5-minute drive of Museum of the Intervention and Playa Coco. When you stay at Oasis in Santa Marta, you'll be near the beach and 9 minutes by car from Artisan Market. Free self parking is available onsite.